It’s true what they say: Paris is always a good idea. Full of glitz, glamour, and romance, there are a lot more reasons to visit this Instagram worthy destination then the clichés we’ve all come to know. From food to culture, to shopping, to music — every black girl needs to visit Paris in their lifetime. However, it’s no secret that Paris can be pricey. Which makes sense, since some of our favorite celebs can’t seem to stay away from Paris either. And while none of us are on a KimYe budget, with savvy planning and know-how, you can indulge in the city without blowing all of your rent money. 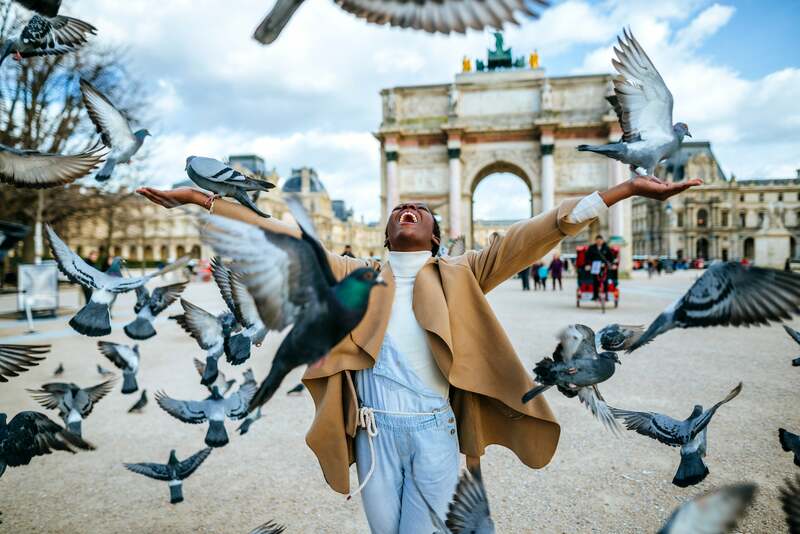 To help you plan your trip, ESSENCE has compiled the ultimate “ballin’ on a budget” guide for your visit to one of the most beautiful cities in the world: Paris! 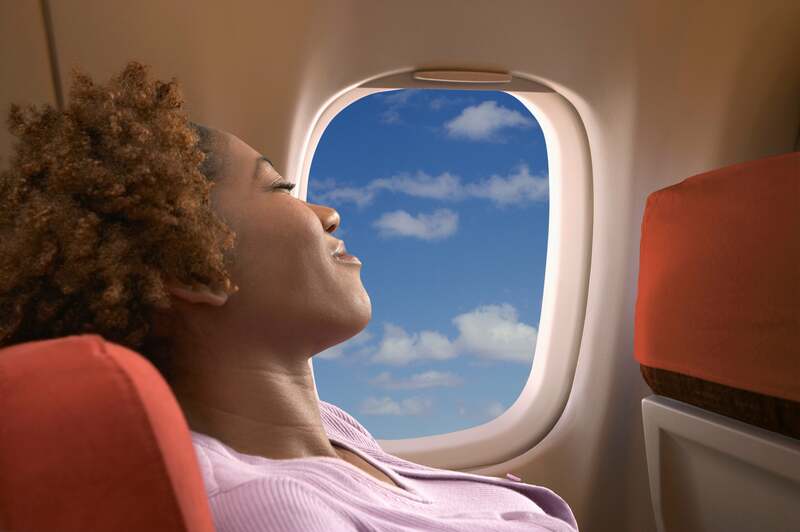 Getting there is easy (and cheap) thanks to Norwegian Air’s discounted and direct flights from the east coast. With off-peak fares routes that start at $99 – from New York, Los Angeles and Fort Lauderdale – there’s nothing stopping you from adding Paris to your calendar this year. The “Low Fare” fare type by Norwegian doesn’t permit an advance seat assignment or include meal service for the roughly six-hour flight, but totally worth it for the quick flight (just make sure you’re equipped with water and snacks). And Norwegian also offers a budget-friendly Premium cabin, which will give you more legroom, seat assignments, a 3-course meal, and lounge access for those who want to take their Paris trip to the next level, but still, keep their pockets intact. Believe us, this is the best (and cheapest) first class cabin you’ll find on any airline. Thankfully, eating out in Paris can be at the lower end of the spending scale! 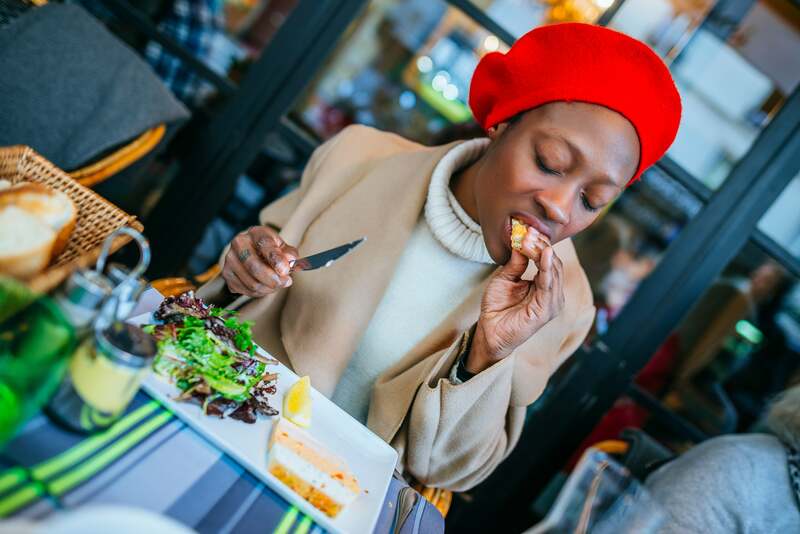 And don’t let the rumors fail you, Paris has some amazing eats that cater to every palate. Serving up soul food in Paris, Gumbo Yaya is hands down the best meal you’ll have on your trip. The menu at Gumbo Yaya is pretty simple. You can either get chicken on a plate with a choice of a side, chicken and waffles, a waffle burger or a chicken burger. Most known for the chicken and waffles, you can’t go wrong with this southern staple. Because the restaurant owner spent his summers growing up in Atlanta, the chicken is seasoned and fried to perfection and the waffle is buttery goodness. The wait may be long and painful, but it will definitely be worth it as a highlight meal that will cost you less than $15 USD. Paris just opened its first nudist restaurant in the 12th arrondissement and you should add it to your list if you’re up for some adventure! While you’ll need to bring a bit of money for this splurge meal, you’ll get to leave your coats, your pants, and your inhibitions at the door. At the 40-seat O’Naturel a la carte dishes start at 32 euros and a three-course meal is available for 49 euros. But an experience like this? Priceless. Dining is simple at Les Papilles. In fact, it’s so easy that they don’t even have a menu. They tell you what you are going to eat (you only get an option if they have pork and you don’t eat pork) in 3 courses. Add this to your restaurant list, and thank us later. Take a trip to the Ivory Coast at La Banane Ivoirienne, which serves up delicious African food, in a beautiful ambiance. Try the kebab and stuffed crab, for the main course, because the meat and fish are delicious (and affordable)! Let yourself be tempted by the famous Aloko (i.e. diced fried banana), which is so savory you’ll want to devour it. Where to start with so many attractions in Paris? First off, with a Paris Museum Pass, because it’s a money-saver. It covers admission to over 50 sights (among them, the Louvre, Musée d’Orsay, Notre Dame towers, Arc de Triomphe and Château de Versailles). If you want to know where the black people are in Paris, you’ll find them at Bizz’Art. A live music venue that moonlights as a restaurant and nightclub, Bizz’Art is conveniently positioned on the edge of the Canal St'Martin. An ideal spot for music lovers and concert goers, you’ll have a great time hear listening to funk, R&B and soul music over some strong cocktails. Paris is alive with black history and culture. Just like America, the City of Light was bit on the backs of Africans and people of African descent who built Paris to what it is today. For those looking to add a bit of education to their Paris visit, this is your deep dive into Parisian black history. The purpose of the Black Paris Tour is to educate and enlighten others on the extensive history of Black Americans, Haitians, and Africans in Paris. On the tour, you’ll get an up close and personal look at this vibrant and flourishing aspect of Parisian life. At this incredibly glamorous palace filled with art, Parisian pool sized ponds and magical gardens is where you’ll capture all of your Insta-worthy moments. This palace is located right out of Paris and with just a hop on the metro you can get there in just under an hour. Then, of course, there are numerous free things to see and do in Paris, including the Eiffel Tower, Notre Dame (not the towers), Pavillon de l'Arsenal, Cimitière du Père Lachaise, Parisian street markets galore and beautiful city parks such as the Jardin du Luxembourg. Paris is all about location, location, location! 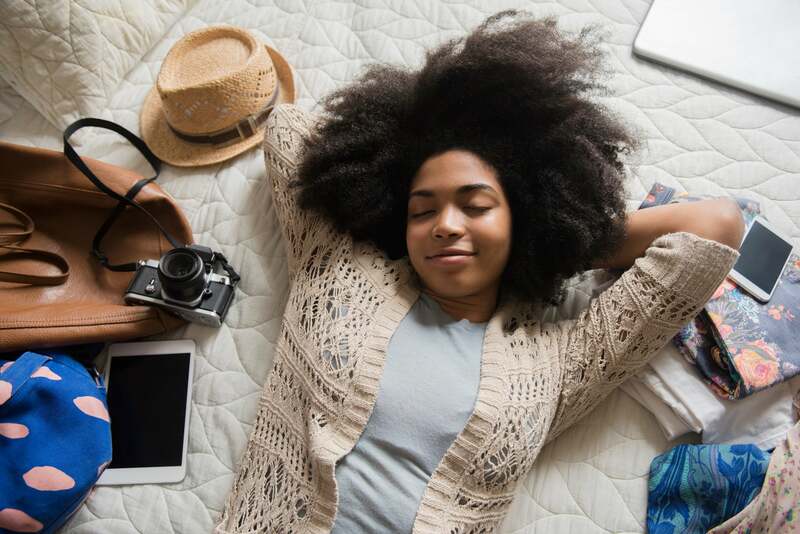 While the hotels near The Louvre, Eiffel Tower, and Champs-Élysées areas are generally too pricey for smaller budgets, Airbnb is always a great plan B whether you’re traveling solo, with your significant other, or with a large group of friends. But for those wanting a traditional hotel experience, or don’t care about location, the central but affordable Left Bank districts include the student-busy Latin Quarter. A few options include, Hôtel Esmeralda which is on a quiet street with prime Notre Dame views, or boutique Hôtel Vic Eiffel in the 15e is an easy stroll from the Eiffel Tower.